Thread: Is this chuck junk?? There are three types of chuck body commonly used. Cast iron is the commonest, it can be brittle and the maximum rpm is usually limited. Ductile cast iron, or spheroidal graphitic is not anything like as brittle and finally steel, which allows higher rpm, but may not have the self lubricating advantages of cast iron. I did find a 125mm or 5" Bison chuck, 3-jaw for 274 euros last night from a german retailer. That is a lot cheaper than what I saw previously. There was an identical looking 125 bison on the same site but over a 100 euros more expensive. The difference is "guss" and "stahl" or cast (iron? steel?) vs steel as I can gather. So what are the possible disadvantages of a cast chuck if any? It has a lower RPM rating (4000 vs 5500) but still 2x what my lathe does (1750). Still researching the vertex chucks too. And check Zentra too. Bison and Zentra jaws are cross-compatible and both supposedly manufactured in eastern europe, wouldn't be far fetched to guess that they come from same factory. I did look up Zentra and oh my, an adjustable chuck for 350, cheapest I have seen those by a metric mile. Am I wrong to think that an adjustable three jaw would be a really, really useful chuck to have? I spent a little more. and seem to have a good one. A couple of years ago I bought a 5" 3 Jaw from Busy Bee tools, IF I remember correctly I paid 116 $ plus tax. This evening I fitted it to a backplate ( Actually just a spare faceplate, because I had it) for my Myford ML 10. A half inch dowel pin showed 5 thous tir when tightened on the poorest key square, 1 thous tir on the best. At 2 " out it showed 5 thous tir dog legging. Thats plenty good enough for this old guy, and I bet it outlives me! I will let you know when or if it wears out. That's a really good question. I bought a used 'set true' 3 jaw chuck last year and have been VERY happy with it. My joy was not only due to the set true capability. The scroll and jaws are in such good shape that its TIR is extremely low regardless of what was being worked on when I centered it last time. It is very repeatable for most uses. A cheap adjustable may or may not work quite as well. If the scroll is not well made, you may find the TIR changing radically as you put different diameters in the jaws. The only way to find out is to buy one! At the end of the project, there is a profound difference between spare parts and extra parts. Stefan Gotteswinter got a Zentra 6-jaw and it seemed to be good. Though he claims it's a chinese chuck. 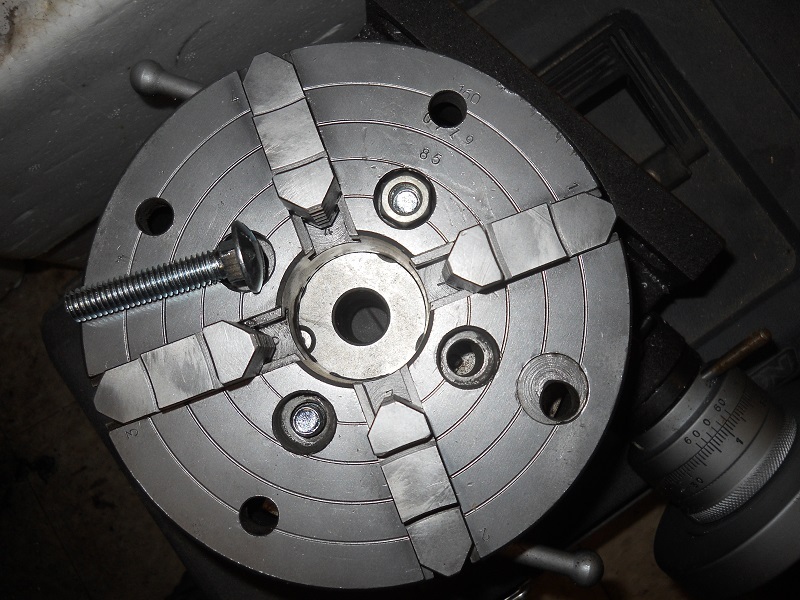 I agree that a 3 jaw self-centering chuck is not the best choice for a RoTab. Using carriage bolts in the tee slots? What are you, some kind of farmer???? ?